Does this 62-date schedule jog your memory of gigs you were at? If so please mail us: and we welcome all reminiscences, set-lists, scanned photos and ticket-stubs! If so please mail us: and we welcome all reminiscences, set-lists, scanned photos and ticket-stubs! Additional research by Procol historian Frans Steensma has been added to Barry's schedule in this sort of type. (Procol rehearsed the Ninth songs the first two months of 1975). Hello, congratulations for the Procol Harum site. I live in Guadalajara Mexico, Guadalajara is the second-largest city in Mexico country. I attended the Procol Harum concert in Guadalajara on August 28 1975, Thursday, at 20.30 hours. The concert took place in the State Auditorium, (Auditorio del Estado in spanish). I was seventeen years old at that time: I bought the cheapest seat, 30 Mexican pesos, about two dollars at that time. The concert was very important because at that time in Mexico this kind of events were not permitted. Procol Harum was very famous in Mexico at that time because some of their songs were transmitted by the radio, I recall A Whiter Shade of Pale and Conquistador as the most popular. Mexico City Guillermo Vazquez Malagamba writes to BtP from Mexico city: 'I visited your website today (which I consider as one of the best in the web dedicated to any band! ; Congratulations!). 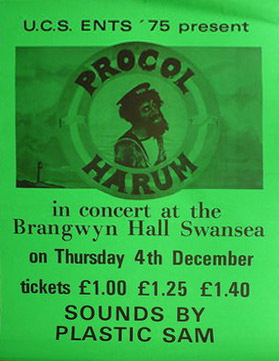 I wanted to know on which days Procol Harum played in the city I live. My three older brothers and some cousins attended one of those concerts, which were at the Auditorio Nacional. 'I also read that they played in Guadalajara, but I don't know on which venue they did it. In Pete Frame's book The Complete Rock Family Trees (1993) he wrote that Procol Harum played in Mexico because the then President of my country asked them to play here. I don't know if that is true. 'I remember that the then Government's TV channel , Channel 13 (sold to a private enterprise in 1993) some weeks later broadcast in two separate programmes some highlights from those concerts. I remember that one of my brothers recorded the audio from the TV speaker. Unfortunately with the passing of time the cassette tape deteriorated and didn't work anymore. But I remember that I watched the TV programmes while my brother were recording them! I remember that he told me that the concerts were very good, but Rock concerts in my country were not allowed in those years because the Government was afraid of riots outside the venue, which, of course, happened when Procol Harum and previously when Chicago played at the same venue. Mexican Rock bands also had to hide their gigs from the police! The supporting act (I was there) was the very popular Johnny's Dance Band, by then featuring Nan Mancini on vocals. Quite big in the Philly area (thanks, Billy from Philly). (ticket) Paul's Mall 'According to featbase, Procol Harum played five dates from 26 October 26 through 30 October 1975 at Paul's Mall in Boston, Massachusetts. The link shows the ticket stub with Little Feat written on it. They must have been added as a last minute opening act. 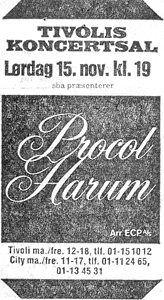 'This fills in the [previous] blanks on the October dates of Procol Harum's touring schedule [this page], also correlating with the time-period both bands were back east.